While I am personally ambivalent about gun ownership and suspect it plays an incremental role in relative differences between countries/regions/etc (holding other things roughly equal), I thought I’d add some perspective into this argument about the presumed causality of gun ownership on homicide rates. Mother Jones analysis includes gun suicides and makes no attempt to correct for even course-grain racial/ethnic confounds. 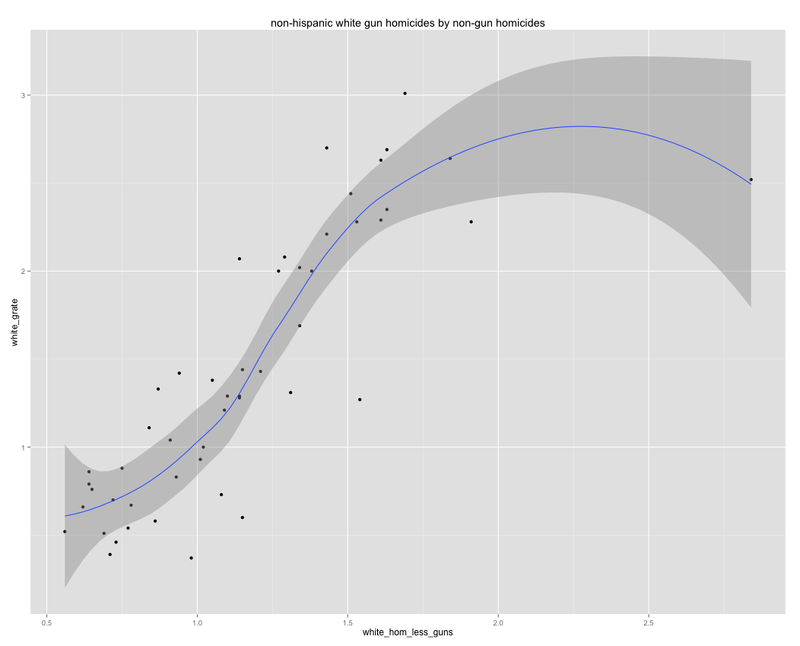 I downloaded the 2009-2013 data for gun-related homicides by race/ethnicity from the CDC’s WONDER database and compared it to the gun ownership rate data via wikipedia. I do not feel like doing a lengthy analysis here and now, but suffice it to say that once you remove suicides and race/ethnicity from the equation the case gets much weaker. There is no evidence of a positive correlation here for blacks and hispanics (if anything somewhat negative). There is a positive correlation for non-hispanic whites (r=0.45), but it pales in comparison to the racial/ethnic differences here. To put this into perspective, amongst non-hispanic whites (the bulk of the gun owners in most states), states with the highest gun ownership rates have just 1 death per 100,000 more than states with the lowest rates (on average). Of course, even when I remove gun-homicides from the equation entirely many of the states with the highest gun-homicide rates are also the states with the highest non-gun homicide rates, ergo it’s not necessarily a safe assumption that gun laws/gun availability differences are driving all of this. The states with high gun ownership and/or high gun deaths differ in more than just gun policy or attitudes towards guns. State gun policy and, perhaps more importantly, individual gun ownership rates are hardly exogenous; it says something about the people in those states/households. Changing West Virginia’s guns laws, whatever they happen to be, likely won’t make West Virginians behave like Minnesotans and (my guess) would have a much lesser effect on homicide rates than some might presume based on naive interpretations of simple correlations.